The last time I took a dedicated road trip with just one other person to look at fall foliage, I ended up getting engaged to him. Yes I know, it’s been that long. It’s not like I haven’t seen foliage every autumn. The leaves in Boston alone are absolutely stunning. Cambridge, especially around Harvard University, is aglow in fiery hues this time of year. Nevertheless, whatever the reason, Bryan and I have not taken a dedicated leaf-peeping road trip together ever since our engagement. That is, until this past Saturday. 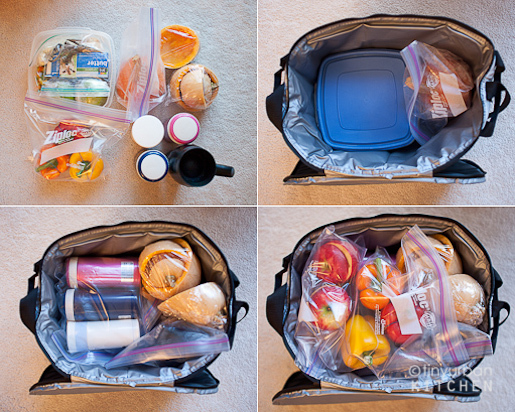 For Round 6 of Project Food Blog, I had to design a meal and take it “on the road.” The goal? To prepare a meal that carries well and tastes great. We decided that Walden Pond would be the perfect place to enjoy a picnic while taking in Boston’s amazing fall foliage. Walden Pond was made famous by Henry David Thoreau, who lived there for two years between 1845 and 1847. Tired of the busy world, he sought out refuge in this quiet and tranquil place. Thoreau’s stay at the pond inspired the book Walden, which some say brought awareness and respect for the natural environment. In the spirit of Thoreau’s ideas regarding our respect for nature, I decided to create an autumn-themed meal where all the dishes would be served in natural “bowls.” Minimal trash would be created from this picnic. Instead, all the “bowls” would either be eaten or composted. Each course would be inspired by autumn, yet would be modified appropriately so that it would travel well and still taste delicious after reaching the final destination. After shopping and cooking for several hours on Friday evening and partially on Saturday, I finally had everything ready to pack up for our special picnic. Foodbuzz had sent us an insulated cooler a few days earlier. One of the rules of this challenge? Your entire meal has to fit inside the bag. We hopped in the car (with all our cameras in tow) and drove to Walden Pond. After wandering down the trail for a bit ( bags were getting heavy!) we finally settled upon this fantastic location right next to the lake. The fall foliage was absolutely beautiful, with red, orange, and golden hues everywhere. I unpacked and set up the meal. Of course, can’t forget the pictures! This velvety-smooth soup is pretty easy to make. Simply saute onions in olive oil or butter, add cut up butternut squash and broth, and then cook until the squash is soft. Blend the soup (most easily done with a hand blender), and that’s it! Add maple syrup and salt to taste. The key to packing this is to have a very good vacuum bottle (such as Thermos). The bottle will keep soup very hot for hours (!) which is so satisfying to drink on a chilly fall afternoon. Once you arrive at the location and right before eating, pour out the soup into hollowed out butternut squash “shells.” Serve! This dish is a twist on the traditional Shepherd’s pie because it replaces mashed potatoes with a trio of mashed pumpkin, sweet potato, and red potatoes. The mashed mixture is layered with ground beef sauteed with carrots and onions. You should ideally pack the filling (potatoes + beef) separately in insulated containers and then plate it right before serving so that the dish stays warm. As a twist on the traditional stuffed pepper, I made a healthy version that would taste good either warm or cold. Mix together chopped bell peppers, onions, and wild rice. Toss with olive oil, salt, pepper, feta cheese, olives, and (optionally) chopped up cured meat, such as ham. Fill each pepper up with the mixture and serve. Since this side can be eaten cold, you can pack this side dish beforehand and serve as is. I rubberbanded my peppers shut to ensure none of the filling came out! I made mulled apple cider at home by cooking apple cider with cinnamon chips, allspice, sweet orange peel, anise, clove, and nutmeg. After filtering the liquid, I packed it in another insulated vacuum bottle, which kept the cider nice and hot. I cored out apples which served as cups and poured the cider into the apples right before drinking. Keeping with the theme of having fruits and gourds as my “containers,” I made mini-apple pies which fit perfectly within a hollowed-out granny smith apple. Homemade pastry dough is surprisingly easy to make (yes, this was my first time). I found this great recipe which involves using a food processor and frozen cubes of butter. I used a muffin tin to bake mini apple pies and then placed these pies into my hollowed out apples. I packed the pies and the hollowed out apples separately, combining then right before serving. We enjoyed a fantastic, relaxing picnic – just the two of us – while staring out at Walden Pond, savoring the simplicity of nature. Although it was slightly chilly, we were blessed with sunshine and a beautiful backdrop. After lunch, we hiked around the lake and enjoyed our own Thoreau moments. And finally, a toast to a successful meal and a wonderful afternoon. I can’t believe I’m still in this competition! Thank you so much for those of you who voted for me the last several rounds. This blog entry is my submission for The Next Food Blog Star’s sixth challenge: Road Trip! If you are so inclined, please vote for this entry (voting begins Monday, October 25). Thanks so much for your support! Everything is wonderfully colourful! Those natural bowls are genius too. I also adore those inside out apple pies. Love it! Good luck to you! I love taking road trips to also witness a fall foliage. All the pictures here are just breath taking. What an awesome picnic! and such a wonderful setting. Thanks so much for sharing your creativity and wonderful photos. I thoroughly enjoyed this post. Love it! I wanna picnic with you! Beautiful colors, photos and design. What a beautiful spread! I especially love how you created serving dishes out of the fruits and vegetables themselves. Looks like it was a very elegant and tasty picnic!